An architecture so white, so magnificent, so delicate and so close to Chicago, it has to be the Baha’i temple. 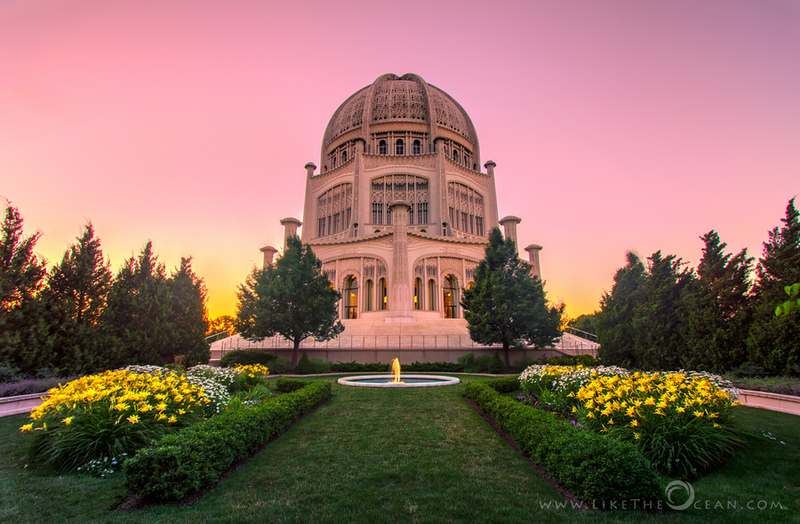 The Baha’i Temple, Chicago is one of only seven Baha’i temples in the world. It is actually the only one in all of North America. The place is enormous and has 9 almost identical entrances symbolizing the 9 major religions of the world and the fact that all are welcome to worship together at the temple. It’s really a pretty fascinating place surrounded by sprawling grounds with manicured symmetrical gardens and fountains. BEAUTEOUS SHOT! What’s even more amazing is this place close-up…it reminds me a lot of the Khajaraho Temples (ever been?) I would often just sit outside and marvel at the detail…glad to see you found the place. I have not yet been to Khajaraho, but couldn’t agree more with the marvelous details. I loved even sitting inside and enjoyning the intricate work on the interior ceiling !!! It’s very welcoming place…no “in your face” attitude…mellow & relaxing…so unlike the average US religious institution. I lived near the Evanston border in Chicago and used to take long walks all along the lake thru Evanston and stop off at the Temple en route to the Yellow Line back to home. By the way, I also love some of your Mahabs shots…don’t know if you know it but I live in Mahabs…the 5 Rathas never look as good as your photos! True Jeff, there are a very few places that are welcoming, especially when u go in with a hefty camera and tripod too :) There are definitely lot more jems around here in Chicago !